When Zhou Yu discards two or more cards, he can make all player regain or lose one unit of health. Once per game, Zhou Yu can distribute up to three units of fire damage. If any player receives more than one, Zhou Yu must discard one card from every suit and lose three health. Zhou Yu cannot voluntarily discard more cards to activate "Qin Music." Zhou Yu can only use "Searing Flame" once per game. If he does not have the required cards to focus the damage he must distribute them among other players. All the damage caused is from Zhou Yu. Zhou Yu can choose to deal fewer than three units of damage with "Searing Flame" if he so desires. Zhou Yu can kill himself with "Searing Flame." Zhou Yu has two great offensive options. "Qin Music" causes a great deal of damage if Zhou Yu chooses to exercise the second option. "Searing Flame" can be devastating if three units of damage are placed on one person. Furthermore, Zhou Yu can sometimes use both powers in one turn to cause four (!) units of damage to one character and one unit of damage to everyone else, provided he has enough cards. Doing this will more than likely kill Zhou Yu, but it may be worth it if he is a rebel pursuing the king. "Qin Music" can be helpful If Zhou Yu and his teammates are low on health. Zhou Yu may have four units of health, but he is certainly not 'built to last.' By placing three units of fire damage on one person, Zhou Yu must exhaust his health and his cards. While it is not necessary to use this power in this way, it is often more useful to do this than spread the damage out among three players. "Qin Music" affects each character in play. Zhou Yu cannot heal himself and his allies without healing damaged enemies. Conversely, Zhou Yu can not cause damage to his enemies without causing damage to allies. In addition, it may be difficult to activate this ability since it requires Zhou Yu to end his turn with two more hand cards than units of health. 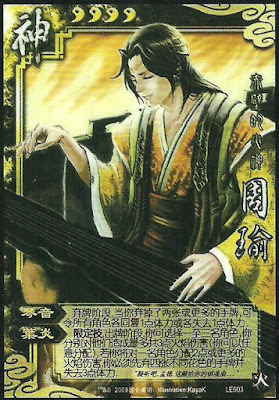 Once Zhou Yu uses "Searing Fire," he is only left with "Qin Music." This is may not be enough to carry him through the rest of the game. Pang Tong - Pang Tong can use "Shackle" to Chain a group of enemies together. Zhou Yu can then cause a great deal of damage to the group with "Searing Flame." Xun Yu/Guo Jia/Liu Bei/Xu Shu - These characters can give Zhou Yu cards so he can use his two powers. Demigod Zhuge Liang - Zhuge Liang can use "Fierce Wind" to make an enemy weak to fire. Zhou Yu's "Searing Flame" will then do an additional unit of damage. However, Zhuge Liang can also cause problems for Zhou Yu. Zhuge Liang's "Heavy Fog" can protect himself and his allies from "Searing Flame." King Zhou Yu is a better king choice than one may expect, but not outstanding by any means. mediocre king choice. In games in which there are five or more players, Zhou Yu benefits from the extra unit of health. He can cause a lot of damage to rebels in a short amount of time. In addition, if a loyalist dies during the use of "Qin Music," he will not have to lose all of his cards. However, if Zhou Yu's powers are mismanaged, Zhou Yu can be killed quickly. Loyalist Zhou Yu is a mediocre loyalist choice. While he can deal a large amount of damage to rebels, he will probably not lost very long. Rebel Zhou Yu is an outstanding rebel choice. He can focus his powers on damaging the and leave him with little health so the rest of the rebels can finish the job. Spy Zhou Yu is a poor spy choice. His powers are better suited for causing a large amount of damage in a short amount of time instead of lasting for a long time. Zhou Yu can be a lot of fun to use, but he certainly will not last a long time. He is best used as a rebel.